Prime Minister Scott Morrison has joined Defence Minister Christopher Pyne to mark a major milestone in the $50 billion SEA 1000 Attack Class submarine project. Defence Connect can confirm the signing of the strategic partnership agreement (SPA) between the Commonwealth and prime contractor, Naval Group, to provide a fleet of 12 Attack Class submarines. Prime Minister Scott Morrison said, "The decision to partner with Naval Group (formerly DCNS) was made in 2016, following a competitive evaluation process commenced by our government after the previous government failed to commission even one single new ship for our Navy. During the negotiations, the government focused on delivering an equitable and enduring agreement in the interests of our nation." "The $50 billion Attack Class program will see 12 regionally superior submarines designed and built in Australia for the Navy. Work on the submarines has taken place under the design and mobilisation contract and this will continue uninterrupted under this agreement," the Prime Minister added. The full range of other activities required to deliver this major program, including the development of the submarine construction yard and the ongoing engagement of Australian industry to achieve Australian sovereignty, are also continuing. Herve Guillou, chairman and CEO of Naval Group, welcomed the SPA signing, saying, "This agreement with Australia will see Naval Group transfer the 'know-how' and 'know-why' to Australia to become an sovereign submarine nation." Minister Pyne said, "Work continues to deliver the first Attack Class submarine, to be named HMAS Attack, in the early 2030s within budget. The formalisation of this agreement represents the contractual basis for the program." Lockheed Martin was confirmed as the combat systems integrator for the Attack Class and will be responsible for integrating the AN/BYG-1 Combat Control System, which will provide an open-architecture submarine combat control system for analysing and tracking submarine and surface ship contacts, providing situational awareness, as well as the capability to target and employ torpedoes and missiles, and become the 'eyes and ears' of the vessels. "Our government is committed to maximising local industry involvement in the program to ensure Australians get the most out of this important national investment," said Minister Pyne. Monday's announcement follows the breaking of ground on the submarine construction yard at Osborne, South Australia in December 2018. Construction of the future submarines is expected to generate about 3,000 jobs annually. The announcement was welcomed by the Submarine Institute of Australia, with President, Mark Sander saying, "The signing of a Strategic Partnering Agreement between the Australian Government and Naval Group for our new submarines, the Attack class submarines, is a significant milestone in this project, which is vital to Australia’s national security." 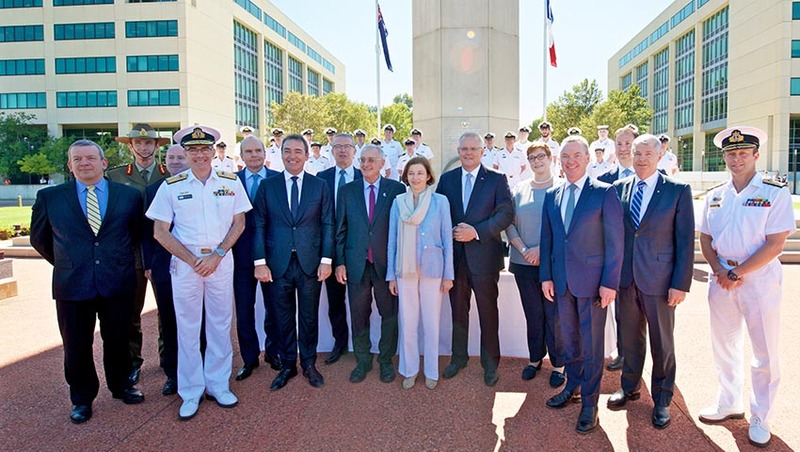 Naval Group Australia (formerly DCNS) – a subsidiary of French shipbuilding company Naval Group – is Australia’s international design and build partner for the Future Submarine Program. Naval Group Australia's involvement in this $50 billion project amounts to more than just the design and construction of 12 regionally superior submarines for the Australian Navy – and will also bolster local industry, create thousands of jobs and transfer world-class technology, knowledge and expertise to Australia.